Brave is a typical feel-good Pixar film. It’s the story of a young girl defying her family’s expectations, a spell that causes chaos and redemption and three young cake-stealing, trouble-causing triplets. It begins with a skilled archer Merida (Kelly Macdonald), who rallies against her betrothal and makes an ill-fated wish to change her fate, bringing chaos upon the kingdom. As Merida sets out to fix the mistake she made, she learns her lesson and the usual happy ending ensues. Of course there’s nothing wrong with a feel-good movie, but the ending of this film was far too predictable. Understandably it is a children’s film, so this wasn’t too much of a problem. As usual, Pixar leads the way with beautifully drawn imagery and colour. The effort that has been put into even the slightest of movements is what makes the whole picture even more beautiful. The highlands of Scotland are captured perfectly in all their exquisiteness. But the film also engages the viewer with its humour. The trouble that Princess Merida’s triplet brothers get into for example, will make you chuckle. Brave also boasts an impressive cast; Merida’s parents (the King and Queen) are voiced by Billy Connolly and Emma Thompson. The soundtrack is also impressive with upcoming singer Birdy, Mumford and Sons, Scottish singer and multi-instrumentalist Julie Fowlis and two songs sung by the cast. 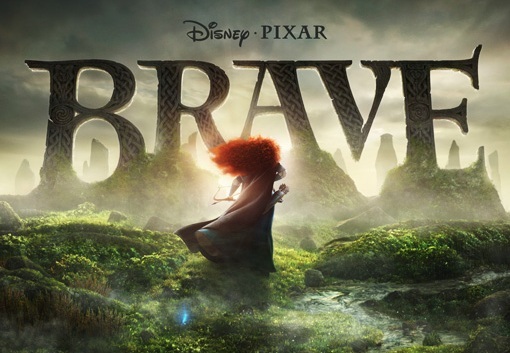 Overall, Brave was a good film but was played too safe and a more adventurous plot would have added to the film. My first attempt at watching it resulted in hours of waiting after the first screening failed. Nevertheless, I waited for the next screening, and finally got to watch it. But this didn’t detract from my enjoyment of the film, and in the end, I’m glad I went. This entry was posted in Film and tagged animation, Billy Connolly, Brave, Emma Thompson, Kelly Macdonald, music, Pixar, Steve Purcell. Bookmark the permalink.